Calibre is an excellent 517U son. He is very similar to his sire, displaying thickness, hindquarter, length and depth. 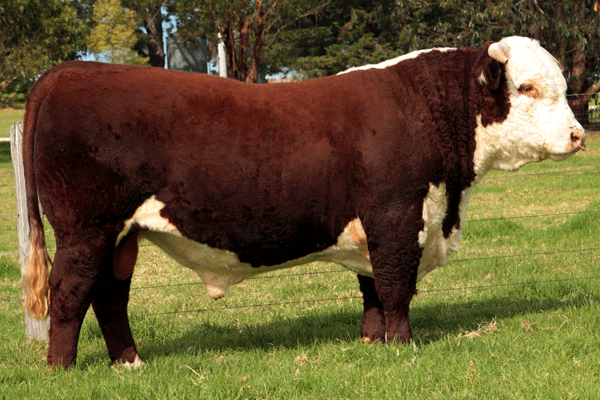 He was Senior and Reserve Grand Champion at the 2015 Herefords Australia National (Wodonga) and sold for $14,000 to Chris Lisle, Tummel Herefords. Calibre has some promising young sons for the future. Miss Titania 414 was one of our youngest donor dams and, of her twelve daughters in herd, five are full sisters to Calibre. She is also the dam of our retained sire, Blizzard. Calibre’s first four Mawarra sons will be offered as Lots 2, 4, 13, & 16 in our 2018 catalogue.